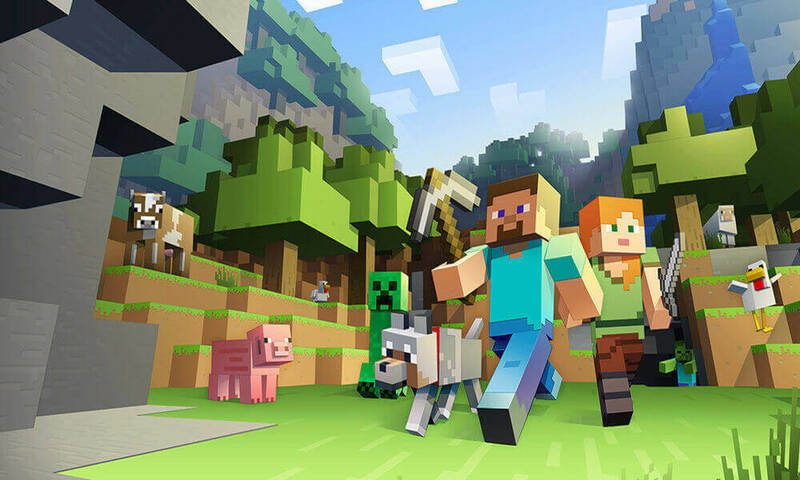 Even since its inception in the year 2009, Minecraft, a sandbox construction game, has become hugely popular with both kids and adult alike. It’s loved worldwide because it gives the opportunity to create almost anything, be it artwork or creative structures by breaking several types of blocks in a 3D environment. 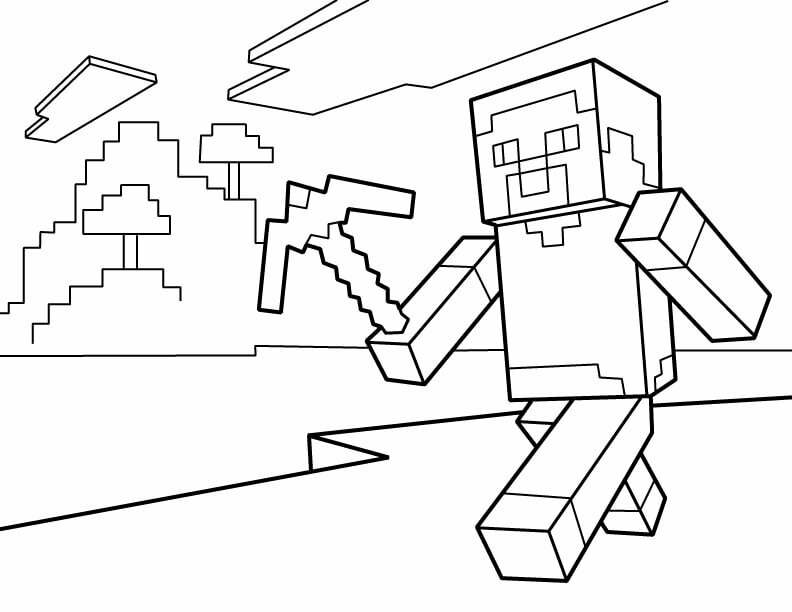 Keeping up with the popularity, we’ve compiled a gallery of 40 printable Minecraft coloring pages below. Take a look! Here’s a coloring page of Alex, the default character of this entertaining game. Alex has pale white skin, green eyes and bright orange hair hanging on the left side. He appears wearing a light green shirt with brown pants and gray boots. 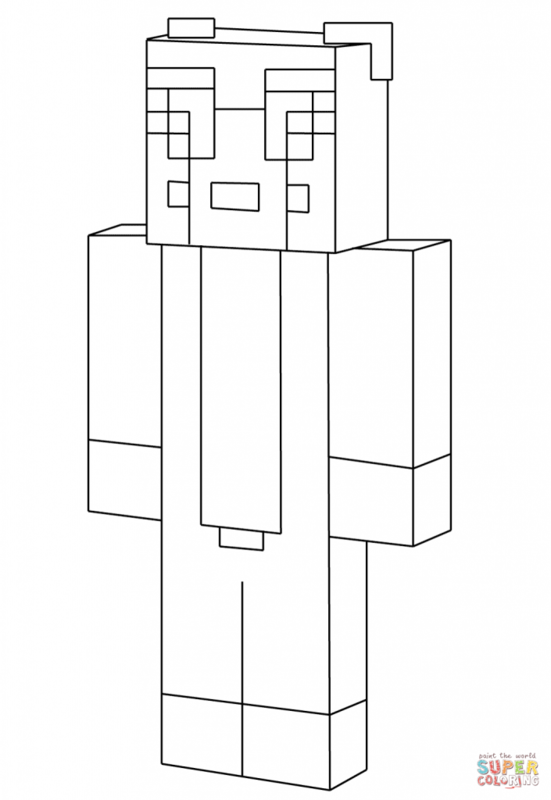 Here’s a coloring page of Steve, the protagonist of this famous game. Very little is known about him, apart from the fact that he’s one of the two playable characters in the game. 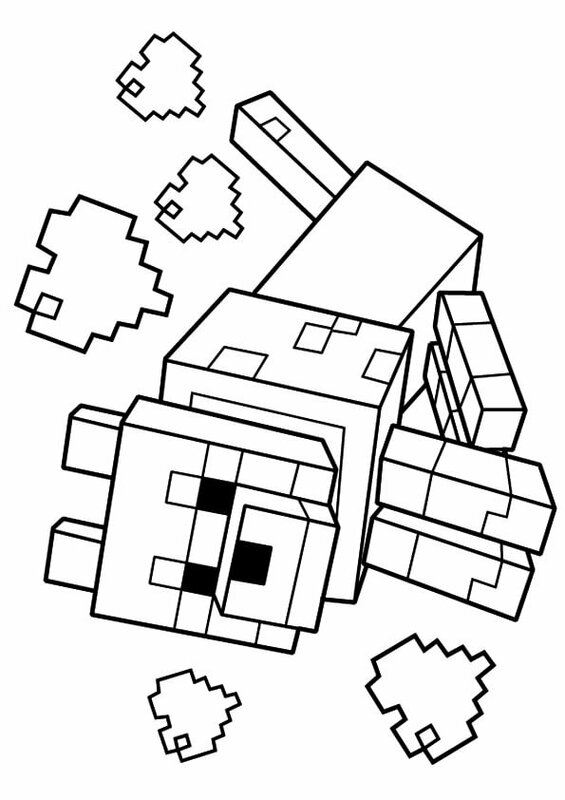 This Minecraft coloring page features a wolf, a neutral, which is easily allied with the players. The wolves in Minecraft spawn only in the taiga, mega taiga, cold taiga, M biomes, and forests. Some players ever tame the wolves as tamed wolves are five times stronger than the wild ones. We’re sure you’ll enjoy filling colors in the little hearts as well. 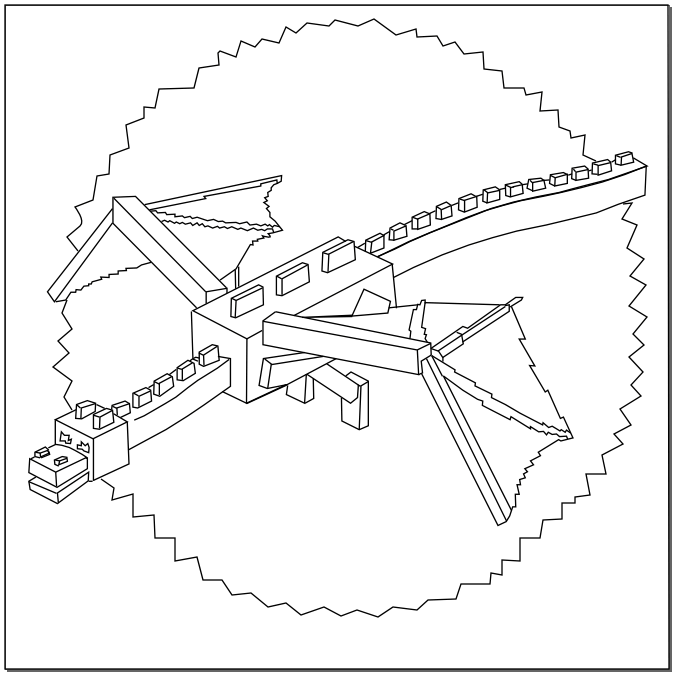 This coloring page features the magnificent Ender Dragon, the first mob to appear in Minecraft. He’s considered by many to be the primary antagonist of the game. When you’re coloring ender dragon, use black for his body, purple for the eyes and gray for the stripes on the wings. Do you know what’s special about these undead creatures? They can spawn from the monster spawners rights inside the dungeon. Zombies can even avoid obstacles easily, such as sheer lava and cliffs and always aim to find the shortest way to towards the player. 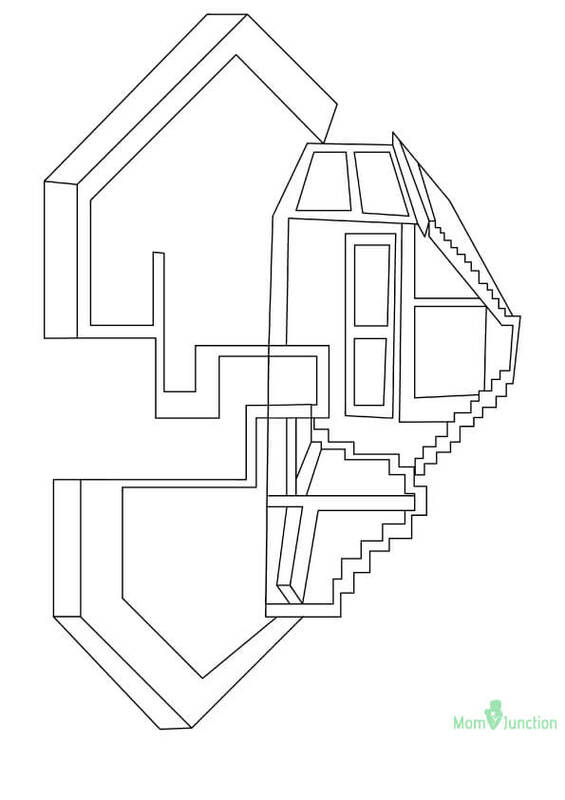 Here’s a coloring page of a Minecraft Spider, a half neutral and half aggressive mob, which can spawn in the groups of 1 to 4. Not only are Spiders faster than other hostile mobs, but they also make creepy noises when they move around. 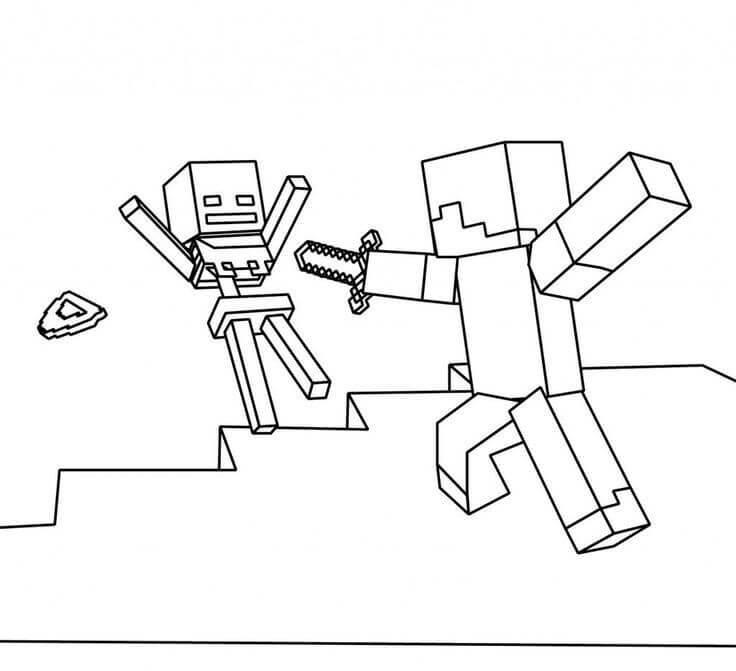 We hate the fact that a character as cute as Creeper is aggressive. 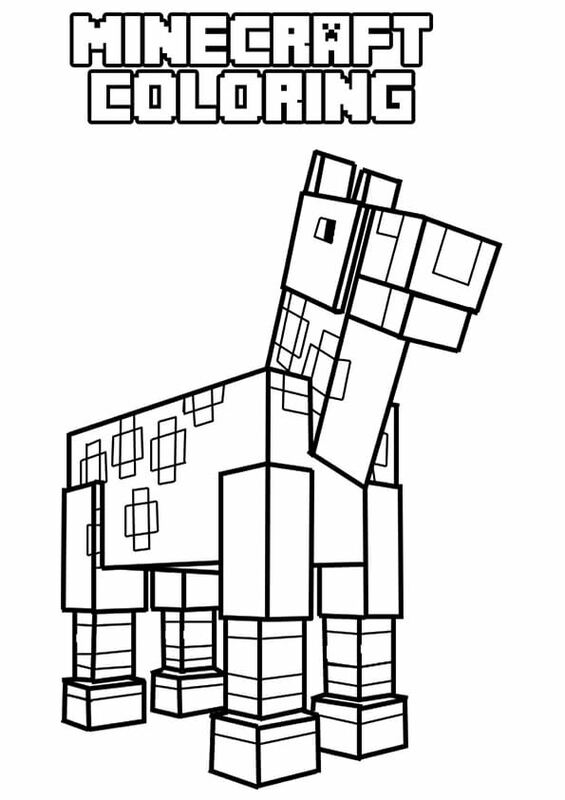 This iconic and unique hostile mob can be recognized by its tall and vertical structure, four legs and green, pixilated skin. Creeper is the most dangerous enemy as it’s unaffected by sunlight. 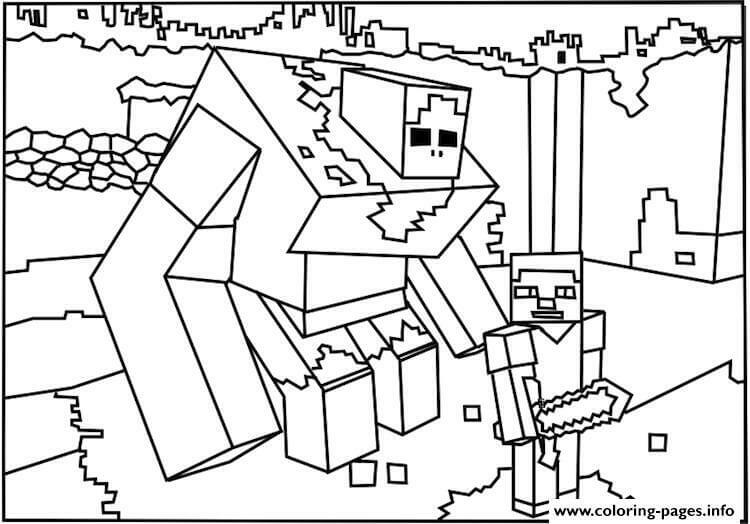 Here’s a coloring page of the wither skeleton, a dangerous, hostile Minecraft mob character spawning in the Nether fortress. The forte of these skeletons is sprinting and attacking with a stone sword. If the player is hit by the wither’s skull, he will be afflicted with the Wither effect. 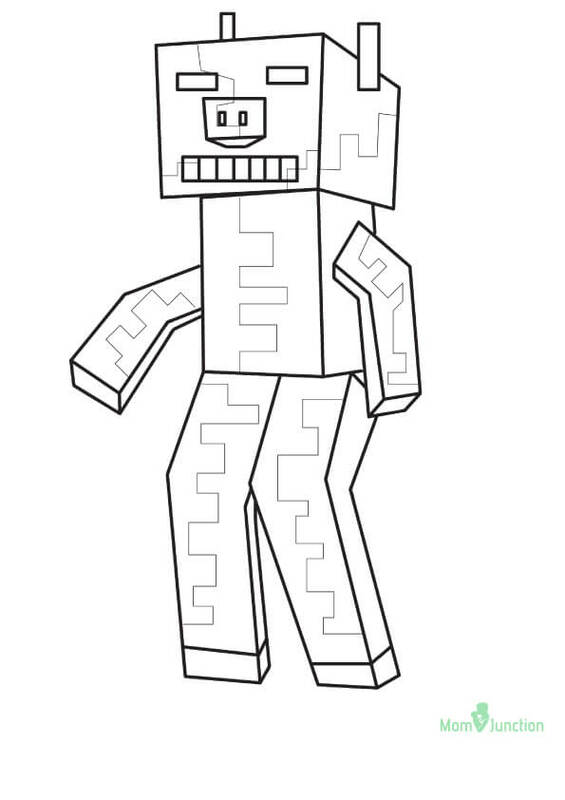 Meet the Zombie Pigman, a neutral mob, which drops rotten flesh and gold nuggets when defeated. Zombie Pigmen usually travel in large groups, comprising of 20 and do not attack any player unless they’re attacked first. You can drown them, but cannot kill them by lava. 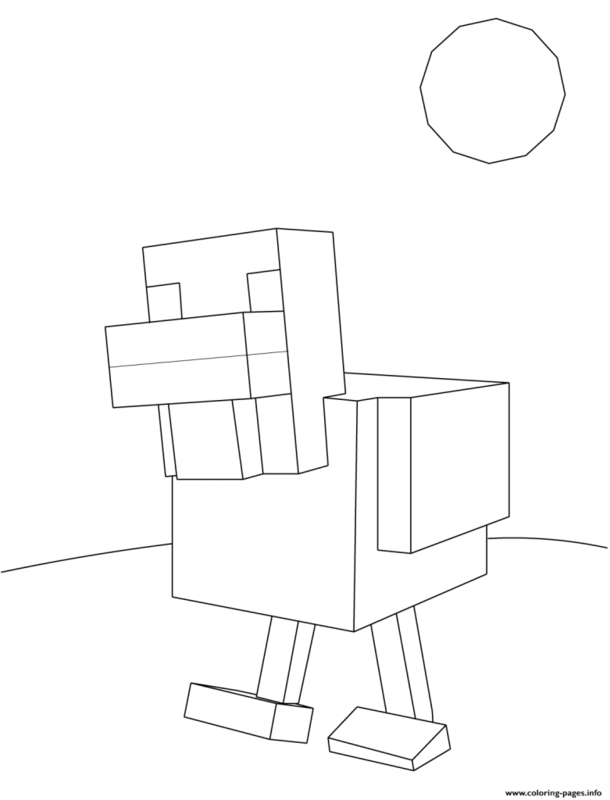 This coloring page features Minecraft Horse, a type of mob that spawns in groups with Savanna biomes and Plains. If you want to get rid of the horse, you need to tame it first. Did you know, horses are the only Minecraft mob that makes noise when they open their mouth? Minecraft cake is the food, which gives players the ability to consume. The cakes are produced by crafting on a plain surface. Minecraft cake is basically a regular block with white icing and cherry or strawberry topping. Meet Ocelot, the kind of tamable mob who can only spawn in the jungle. This character is based on real life ocelots, with the yellow body, black spots, and green eyes. These shy, but agile character sprints away if the player hits or surprises it. 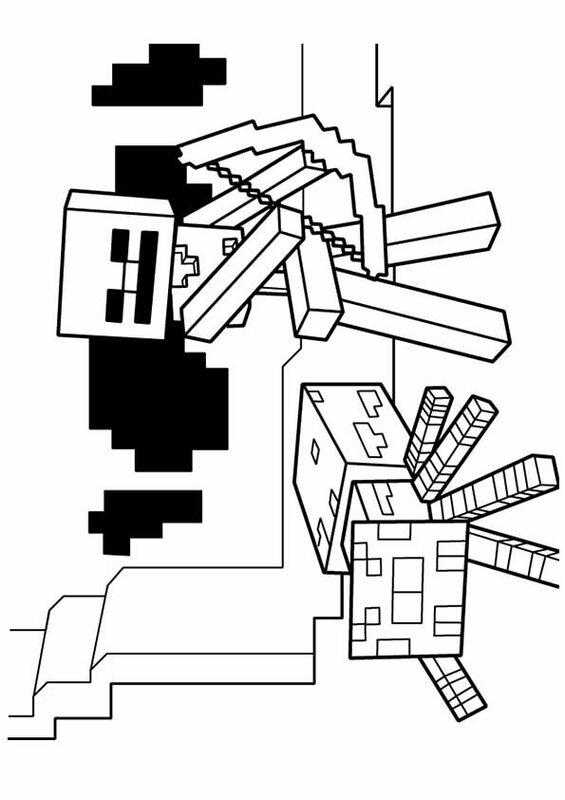 In this coloring page, Enderman, the three blocks high neutral character with the ability to teleport is seen doing something with the blocks. What he’s doing is quite unknown to us. 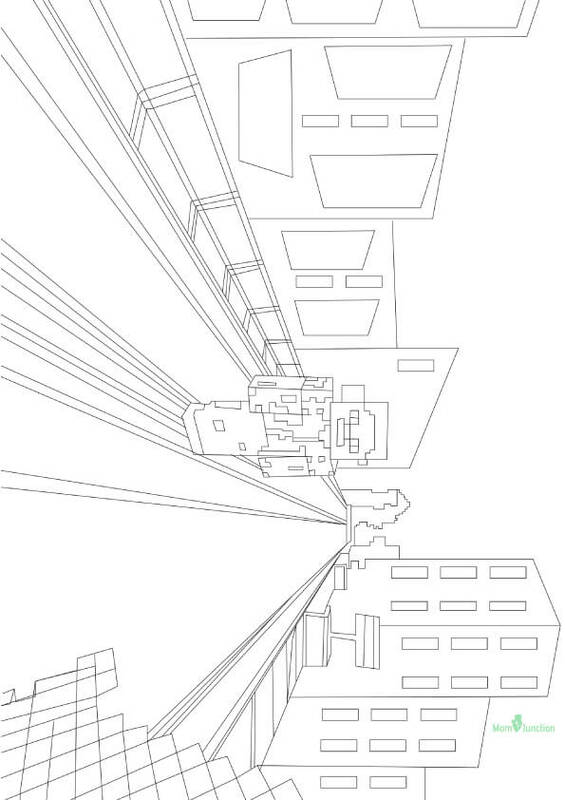 Maybe, you can ponder over while coloring this image. 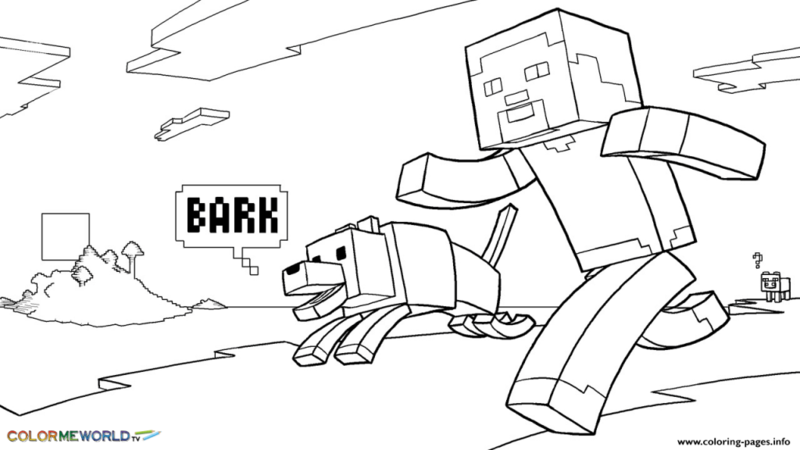 Those who’re fond of farming are sure to enjoy filling colors in this Minecraft farm coloring sheet. The farm, featuring in all the game modes is used for planting seeds, harvesting crops and taming or breeding animals. 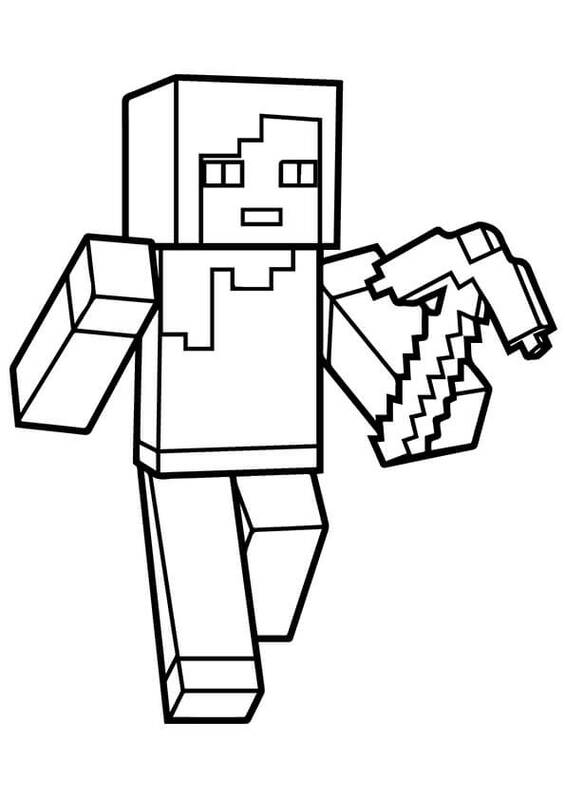 Here’s a coloring sheet of Herobrine, a creepy pasta, who was never actually added to the actual game, but often haunts players while they’re playing. 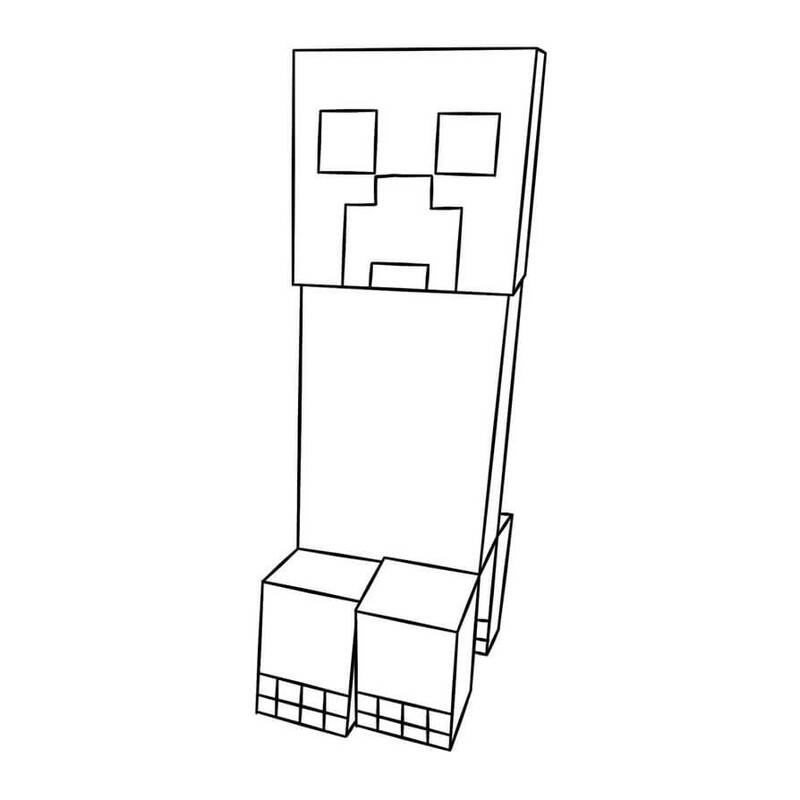 Herobrine has some of the most incredible magical powers, one being his 360-degree vision, which gives him accelerated perception and recognition. 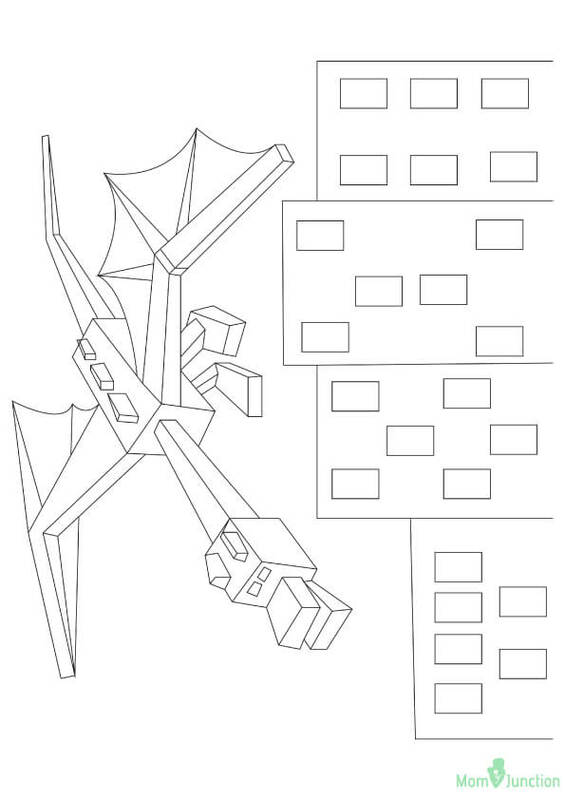 This coloring page features the arrow firing skeleton with the spider. It’s a part of the undead, hostile mob, equipped with bow and arrows. The most striking feature of this mob is that it can spawn almost anywhere. 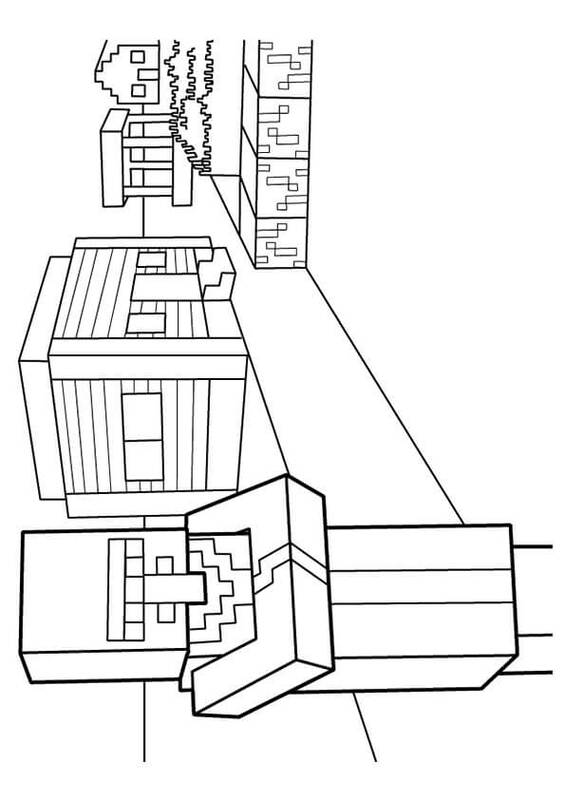 Here’s a coloring page of the Minecraft world, the place where the maximum action takes place. 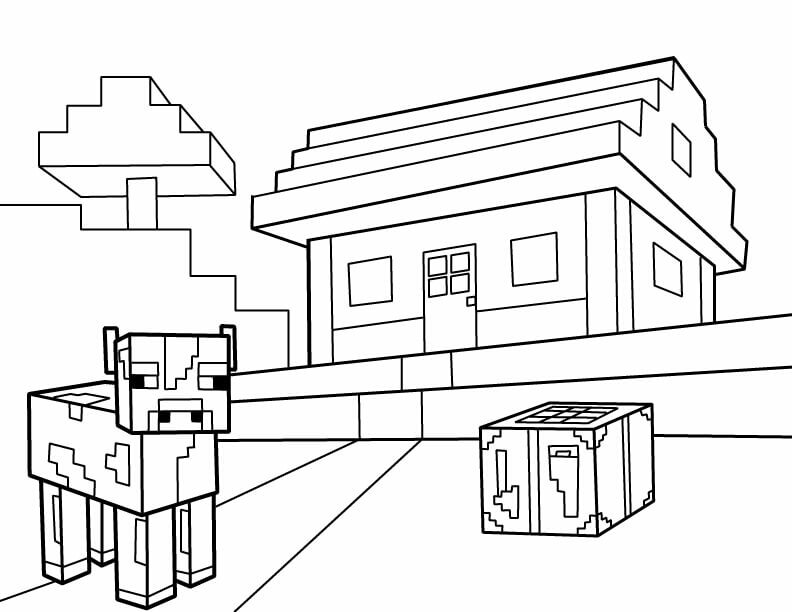 Fill the coloring page with brightest colors, or even better, try to emulate the real Minecraft world. Pickaxe is the master tool in the Minecraft game. It’s required by players to mind the blocks and ores in the Minecraft world. Pickaxe is even required to gather mineral resources like coal and iron ore. You get the option of selecting various types of Enchantments for the pickaxe. 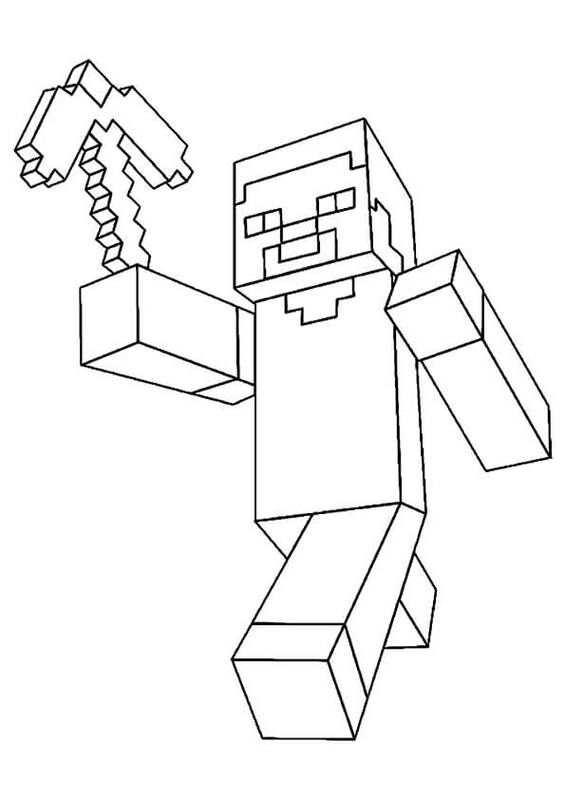 This coloring page features Steve with Pickaxe, his most used sword. It seems he’s all set to fight the violent and nasty mob skeleton with this sword. And we’re confident that he will be triumphant in his endeavor. We told you that Steve will successfully defeat the skeleton mob and he’s done exactly that. Only wither skeleton was left and Steve has successfully defeated him as well. And why not, he fought with his favorite sword, after all. 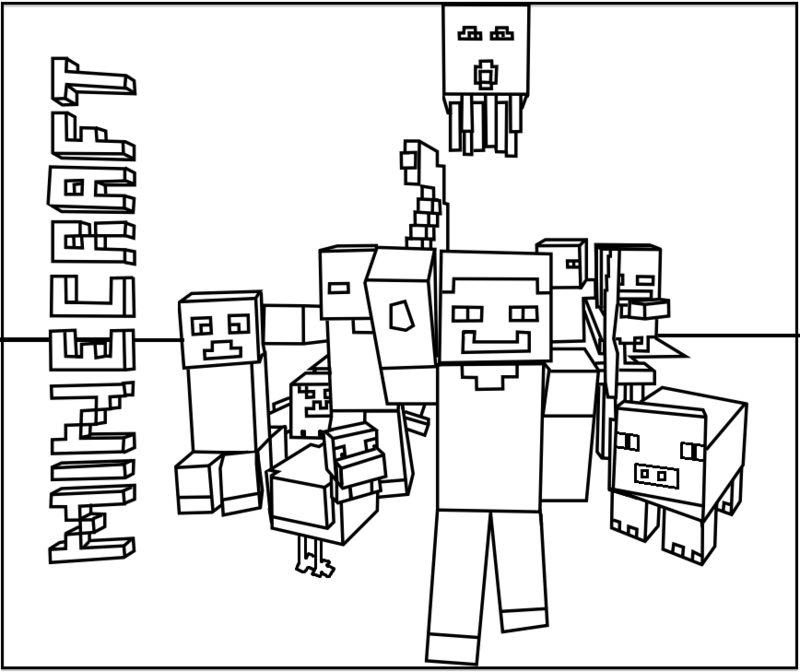 Here’s a coloring page of the Minecraft mob, the living game entities that interact with other players. The mobs are divided into several categories, such as Neutral, Hostile, Utility and Passive. Utility mobs are created by the players, Passive mobs are harmless and never attack players, Neutral mobs attack players only when provoked and Hostile mobs attack players when they’re within a certain range. Steve looks very excited in this coloring. It seems that he has found something and is running to get it. But how could his loyal friend be far behind? 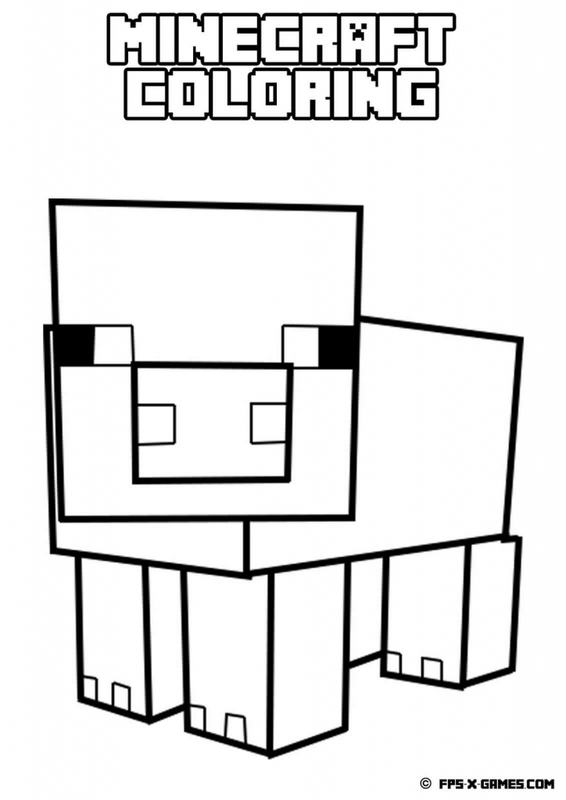 We can also see a Minecraft pig on the coloring page. 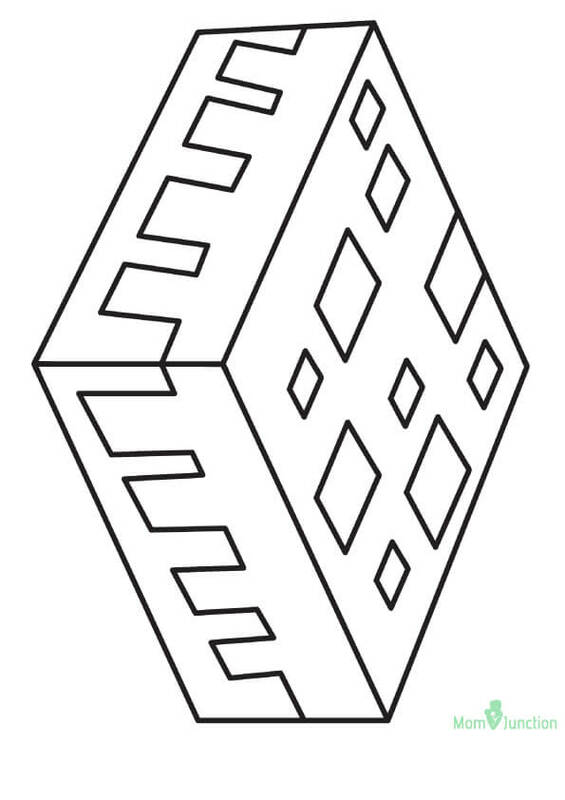 All in all, we think it’s a beautiful Minecraft coloring page. In Minecraft, sheep are probably the most encountered mobs. These carefree fellows are usually found wandering throughout the Overworld. And their primary purpose is to supply raw mutton and wool. Squids are the first water dwelling mob appearing in Minecraft. These eight limed, aquatic mobs can be found in the water of any depth of all the Biomes. When the Minecraft squid moves, its tentacles open and close, making it look like they are pushing through the water. 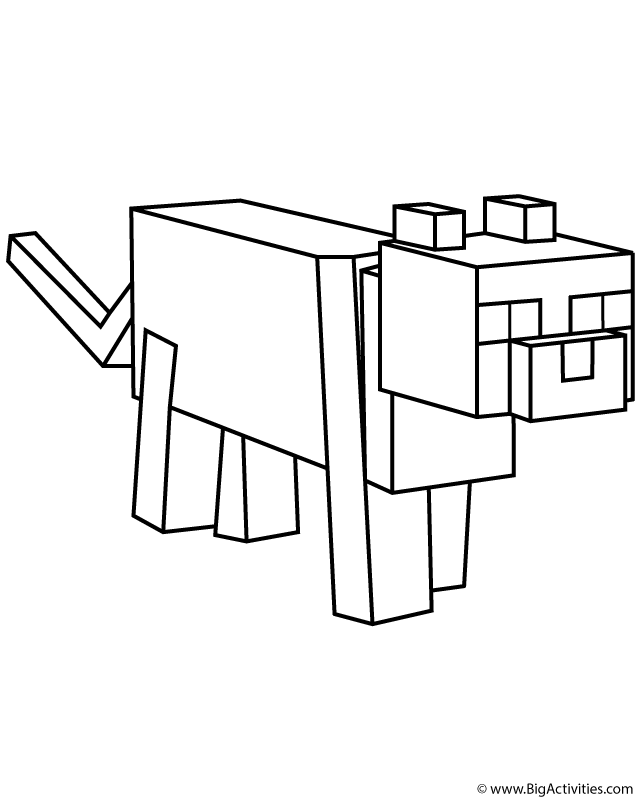 Stampy LongHead, the yellow, boxy cat is the Minecraft avatar of none other than Joseph Garret. This amazing guy produces educational shows, videos and game tutorials for the kids. Two Face, from “The Dark Knight” is one of the Minecraft skins, which players can use. We believe children who’re major fans of the “Batman” series will love this skin. 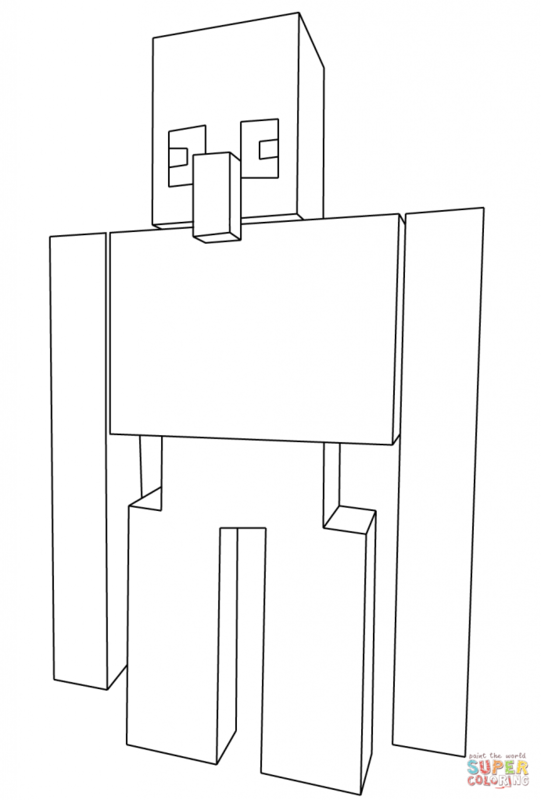 As strange as Iron Golems look, they are really useful in the Minecraft world as they are utility mobs. Built with iron and jack-o-lantern, Iron Golems are immune to damage, drowning and even knock back. They spawn naturally in villages. 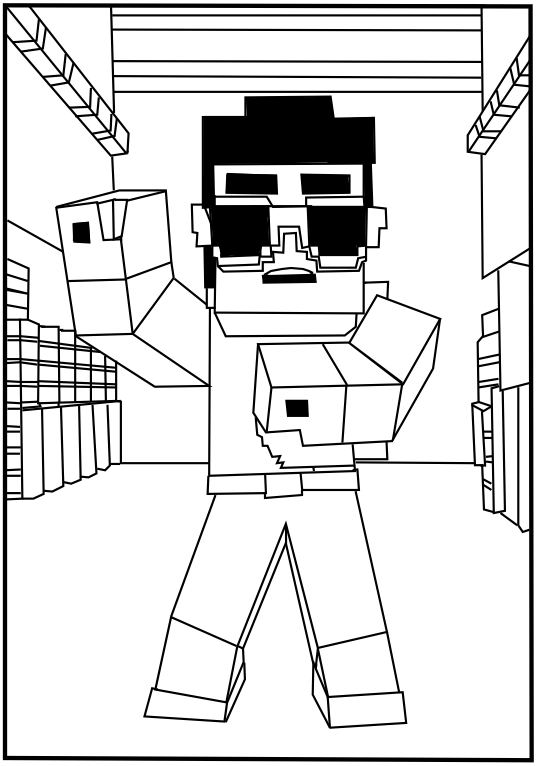 The Minecraft Gangnam style video was released soon after the song became a major sensation all over the world. But don’t you think PSY looks more like Elvis Presley in this coloring page? 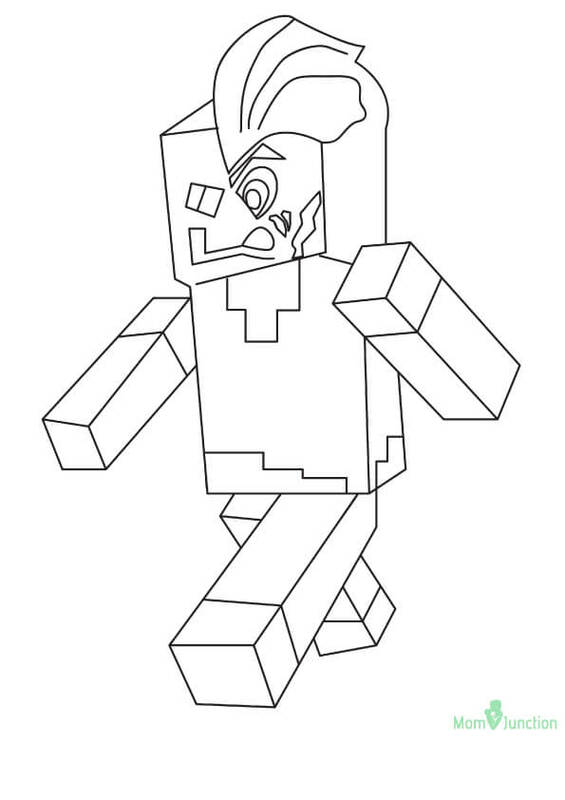 No matter how he looks, this Minecraft coloring sheet is absolutely fantastic. Minecraft pig is a passive mob spawning in the marshy and grassy regions of the Overworld. They come in two textures files, one with a saddle and one without, as players get an option to saddle the pigs. Minecraft pigs are useful for gathering pork chops, farming and riding. 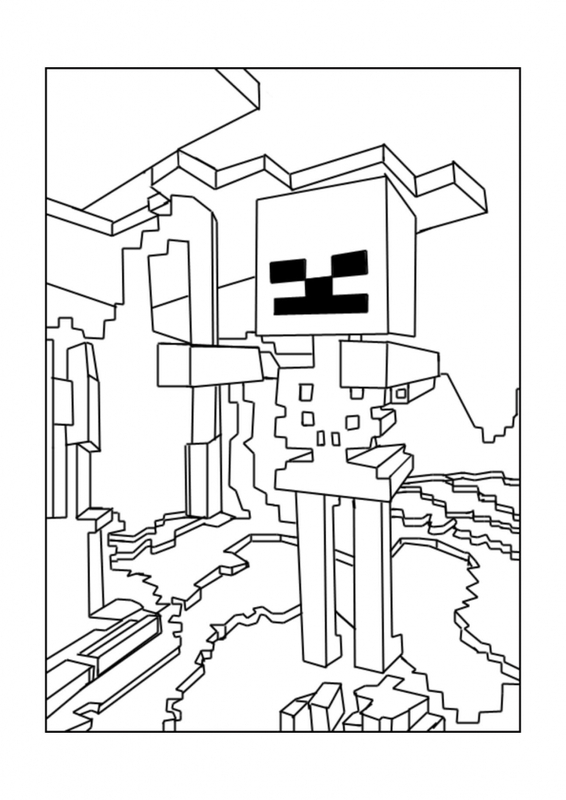 This is one of the most awesome printable Minecraft coloring pages in our opinion. It features a cow standing in front of a huge house. Cows, the passive mobs of the Minecraft world are the sources of milk, leather, beef and steak. They drop two pieces of leather and three pieces of raw meat when killed. It seems that this Minecraft villager has been assigned the duty of looking over the village. And going by his strict and stern looks, he seems to be a fairly good watchman. At least miscreants will think twice before entering the village. Ender dragon has never looked so fierce before. It’s seems that he’s hell bent on destroying the beautiful world created by Steve and Alex. Perhaps, you can calm him down by filling some colors in his image. 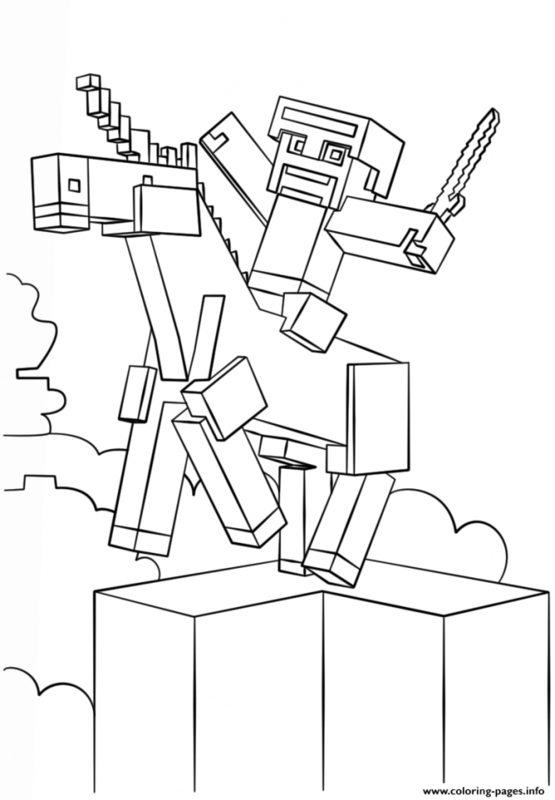 This is one of our rarest Minecraft coloring sheets as it features the beautiful and majestic unicorn. 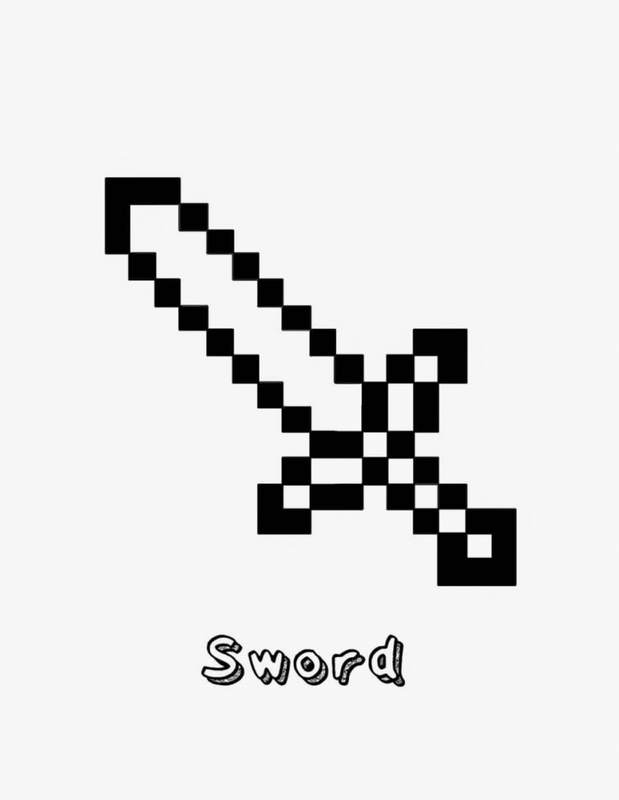 Minecraft unicorns come with loads of armor and accessories, and have unusual magical abilities, which make them powerful allies. It’s not easy to spot a unicorn, so keep an eye for it and tame a few of them, if possible. Chicken, the passive animal mobs living throughout the Overworld are much slower performance wise than the other mobs. But they do have a unique ability, which is flying safely to the ground by flapping the wings, which prevents fall damage. They even flap their wings to keep from dying in water. Tiny, but mighty silverfish are hostile mobs with black eyes and silver skin. You’ll find them hiding in blocks found in strongholds. What makes silverfish stand out is its ability to turn into monsters. They even awaken the nearby silverfish when they are attacked. Sneaky creatures. Ghast may look innocent, but do not let his cute appearance fool you. Ghasts are basically floating Nether mobs, which shoot fireballs at the players. The Big White Guy seen with Steve has been baffling people for quite some time now. Nobody knows who they are and where they came from. 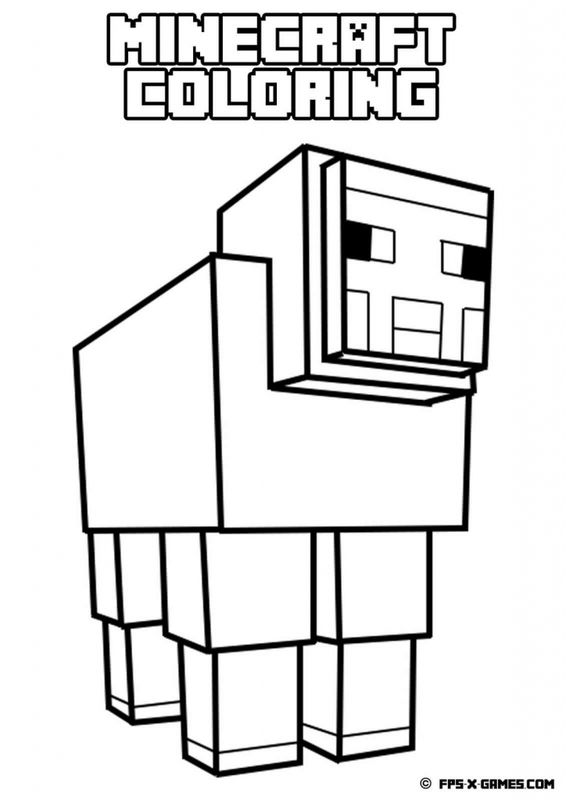 Some people say that it’s a form of Iron Golem. Perhaps our readers can help us in this. This coloring sheet features the epic fight scene between Alex and Steve. We have no idea why they’re fighting. Why don’t you write down a story of this battle scene before coloring the image? 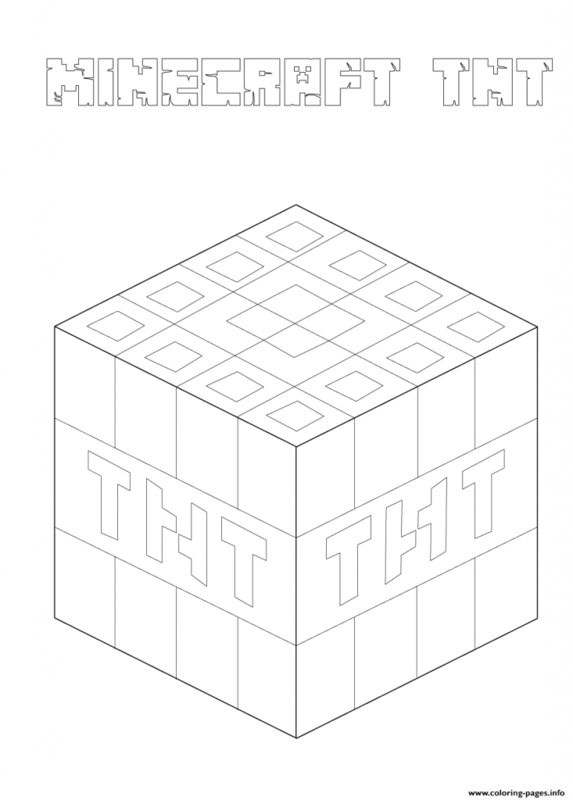 You’re not a true Minecraft fan if you don’t know what TNT is. Okay, that’s a bit harsh. Well, TNT is basically the block used by the players to initiate an explosion. This block can be broken instantly, with or without any tool. 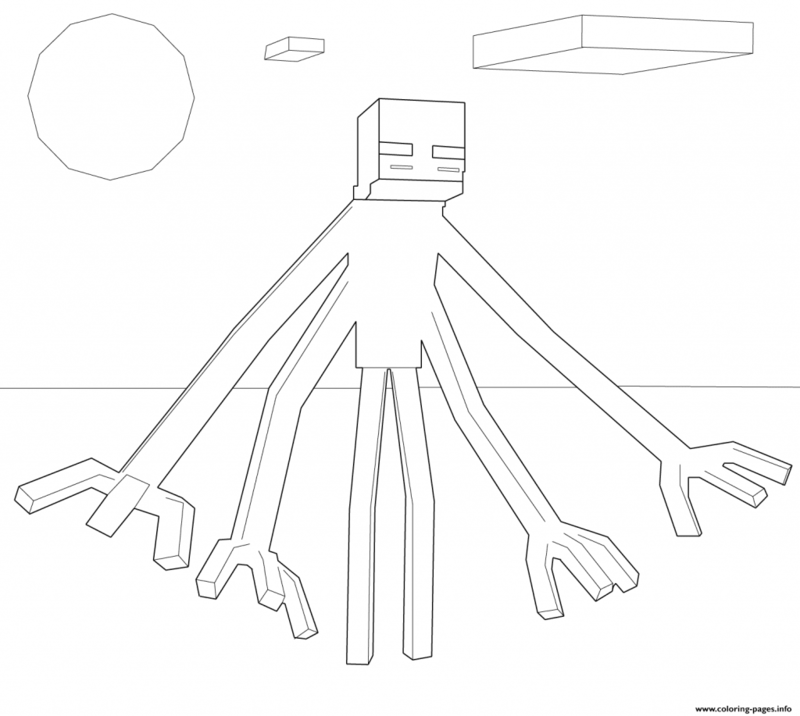 We’re rounding up the list with the coloring page of Minecraft Mutant Enderman, the mutant version of Enderman. With a hundred hearts and some supremely powerful abilities, it’s difficult to defeat Mutant Enderman even with diamond gear and diamond armor. Mutant Enderman kills the players by pulling towards itself and blinding it. 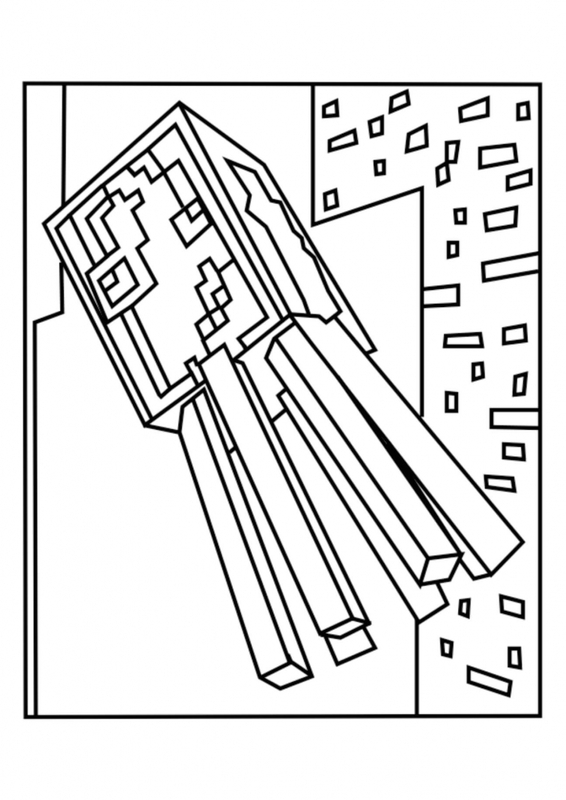 We hope you liked our list of printable Minecraft coloring pages. 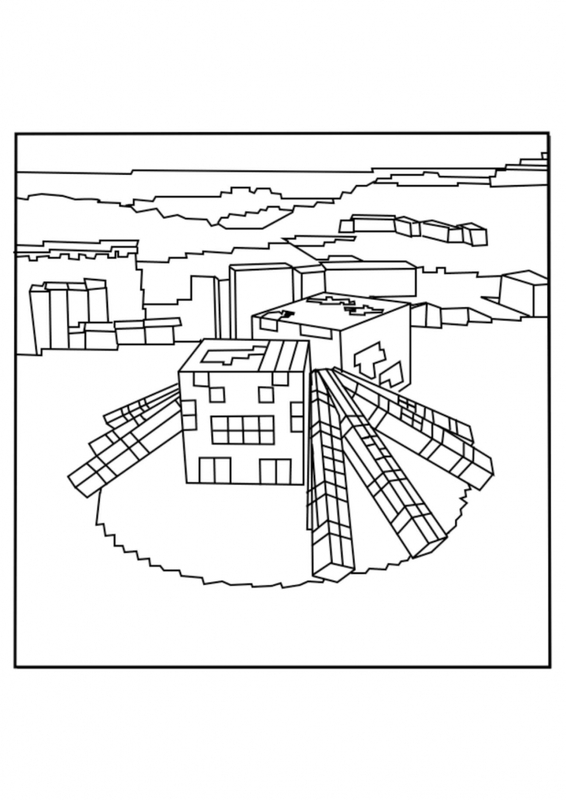 These coloring sheets will allow you to express your creativity to the fullest. 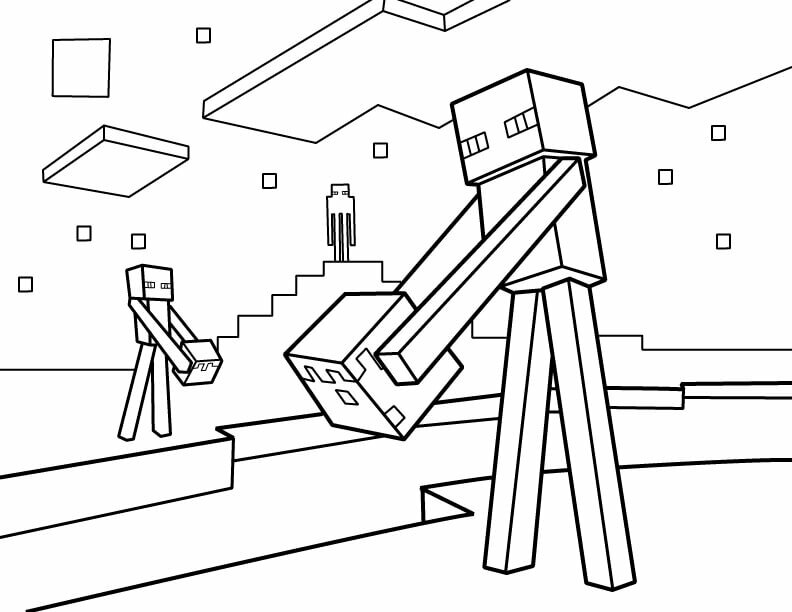 So build worlds and start painting these awesome Minecraft coloring pages. Also, we’ve tried our level best to include images of all famous characters. But if you think we’ve missed any, let us know by commenting below. Your feedback is essential to us. Until then, happy coloring!